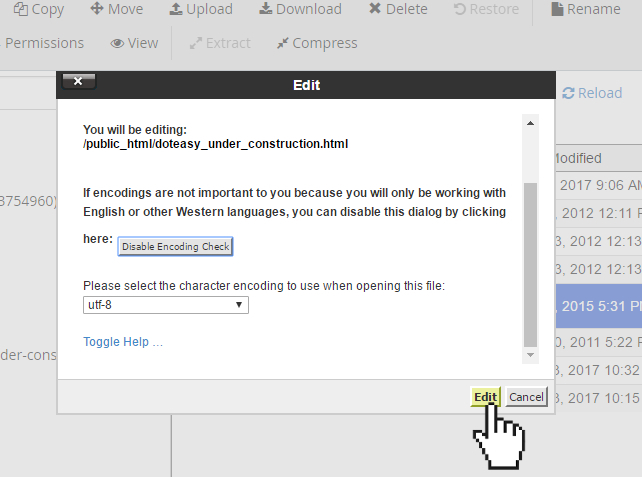 Editing an existing file through File Manager allows you to make immediate changes to your website without having to upload a new version of the file. The Edit function is useful for small changes. However, if you need to make large alterations to a file, it might be easier to simply upload the new file and use the overwrite function to replace the existing file on the server. Navigate to the folder where the file is located. Click on the name of the file. Click on the Edit icon. This will open the Edit window. Click Edit. This will open a new window with the content of the file displayed. When ready, click Save Changes on the top toolbar. The new changes will be saved and will take effect immediately.